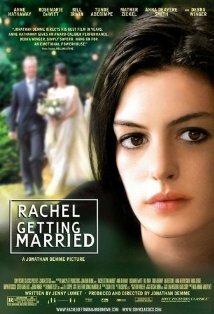 Rachel Getting Married is a very powerful film. The story is distressing and yet all too common. Kym has been in and out of rehab for 10 years. She gets a weekend pass to go home for her sister Rachel's wedding. All the old family dynamics and injustices emerge and the various family members struggle to manage them as best they can. The primary theme of this movie is absolution, redemption, and exoneration. Kym killed her younger brother, Ethan, when she drove the car they were both riding in into a lake. Ethan was strapped in his car seat and drowned. Ethan, obviously, was not physically at the wedding, but his ghost haunted the whole family as they attempt to celebrate Rachel's wedding. This film is extremely well done in cinema verite style. It would be a good discussion starter for church groups about addiction, its affect on the family, how family's deal with tragedy, and how people achieve absolution and redemption. This family is not good at resolving hurtful issues. They struggle and could have used some help. For the most part they struggle alone with the help of a few friends but no where does faith or religion come in which leaves the story devoid of any transcendent theme except the love of the two sisters Rachel and Kym which is mightily strained but continues to under gird their relationship and gives the film a sense of hope but no cliched answers. I highly recommend this film. It gets 5 stars on the Markham 5 star scale. You can learn more about the film at the Internet Movie Database by clicking here. This article is being tagged "spiritual themes in pop culture" and is the first article in this category which will be used periodically now on this blog. Powerful movie. I think it is an important movie about addiction and family dysfunction. Anyone with experience with addiction and who has grown up in a dysfunctional family will identify with the characters and themes of this movie. Great movie about redemption, absolution, exoneration, and the power of love. Would be a great discussion film for adult ed groups. Very good movie. How does one overcome the guilt of killing someone? Other religions like Christianity offer forgiveness and Jesus death on the cross for our sins, what does UU have to offer?